The bobtail squid stays alive because it attracts and keeps a specific kind of bacteria. Scientists still don’t know exactly how it does this, but new research could shed light on why some people get hit with the closely related flesh-eating bacteria. 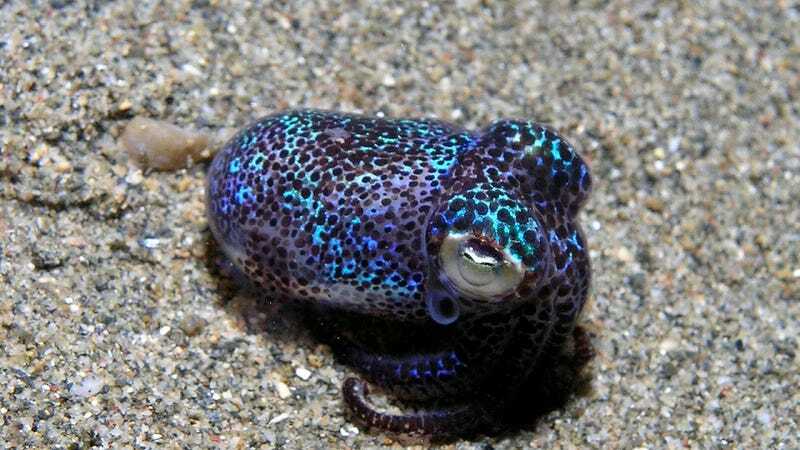 Like a fair amount of ocean animals, the bobtail squid shimmers with bioluminescence. It does not produce the light itself. Instead it maintains little homogeneous colonies of luminescent bacteria—in this case Vibrio fischeri. No other bacteria can come and dim the squid’s sparkle. What’s more, the squids aren’t hatched with the bacteria. They swim around the ocean, picking up and cultivating this one kind of bacteria as they go. The fact that V. fischeri produce light allowed researchers at the University of Wisconsin, Madison (UWM), to conduct experiments on how the squid attracts them in the first place. As reported in a recent paper in Applied and Environmental Microbiology, they found is the bacteria have a sensor that allows them to note the presence of “short- and mid-chain aliphatic (or fatty) acids.” These fatty acids consist of a molecule of carboxylic acid attached to a long chain of carbon atoms which are surrounded by hydrogen atoms. If your cells have membranes, those membranes are made of fatty acids. When the UWM scientists lowered a vial of fatty acids into a vat of water and V. fischeri, this is what they got (see photo, left). What looks like a light bulb is actually the bacteria clustering around the fatty acids. The more concentrated the acid, the more the bacteria clustered around. But that doesn’t mean that the receptor is unimportant. It seems to be important to the bacterium—it has two copies of the gene that codes for the receptor. It may also be important to V. fischeri’s relatives, Vibrio cholera and Vibrio vulnificus. We know what V. cholera is the bacteria behind cholera, while Vibrio vulnificus is what causes necrotizing fasciitis. If we can find a way to repel the bacteria, we might have a way of preventing infections in hospitals. Or we could figure out what draws V. fischeri and all have bioluminescent skin by 2025.